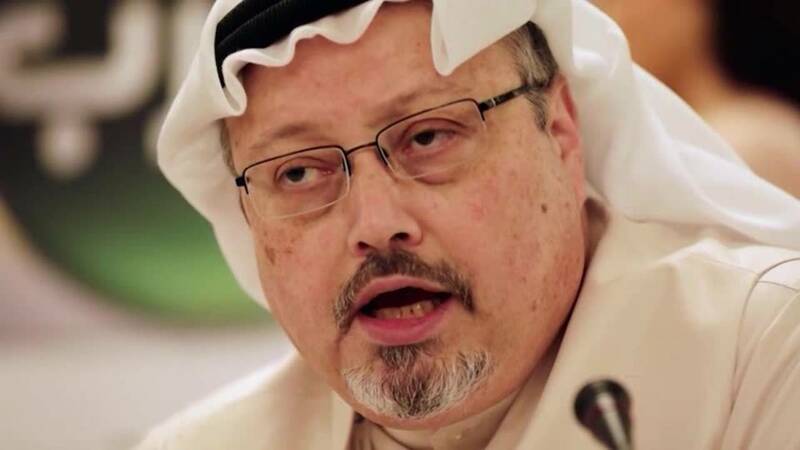 (CNN) - President Donald Trump signaled Tuesday that he will not take strong action against Saudi Arabia or its Crown Prince Mohammed bin Salman for the murder and dismemberment of Washington Post journalist Jamal Khashoggi. The White House has been struggling to square a widespread sense that the crown prince directed the killing with a desire for Saudi support for its foreign policy priorities and the need to manage close relationships between bin Salman, the Trump administration and members of Trump's family. In an exclamation-mark laden statement subtitled "America First!" Trump said on Tuesday that "our intelligence agencies continue to assess all information, but it could very well be that the Crown Prince had knowledge of this tragic event -- maybe he did and maybe he didn't!" Speaking to the press later in the day, Trump cited the Kingdom's influence over oil prices and said, "if we abandon Saudi it would be a terrible mistake." He also said he was "not going to destroy the economy of our country" over Khashoggi by giving up arms deals to Saudi Arabia. "It's a very simple equation for me. I'm about make America great again and I'm about America first," Trump said. "We may never know all of the facts surrounding the murder of Mr. Jamal Khashoggi," Trump said in his statement. "In any case, our relationship is with the Kingdom of Saudi Arabia. They have been a great ally in our very important fight against Iran." Less than an hour after the statement, Trump appeared in the White House Rose Garden to pardon two turkeys for Thanksgiving. He did not mention the journalist's murder. The President's statement sets up a clash with lawmakers from both parties who have called for harsh measures against Saudi Arabia and expressed deep reservations about US support for the Kingdom's war in Yemen. It once again pits Trump against his intelligence agencies and bolsters a regime that has admitted to killing a vocal critic and member of the press. Lawmakers noted there is a cost to ignoring "our moral voice," as Sen. Lindsey Graham, a South Carolina Republican, said. Republican Sen. Rand Paul of Kentucky was more pointed. "I'm pretty sure this statement is Saudi Arabia First, not America First," Paul tweeted. Senate Foreign Relations Chairman Bob Corker, a Tennessee Republican, said, "I never thought I'd see the day a White House would moonlight as a public relations firm for the crown prince of Saudi Arabia." While Riyadh has maintained that neither the crown prince nor his father knew of the killing, intelligence officials, lawmakers and analysts familiar with the country have assessed that an operation of this nature and scale could not happen without the direction and awareness of the crown prince, who controls all the country's security services. A senior administration official told CNN that an intelligence report about the murder reportedly sent to Trump on Tuesday and delivered in physical form is an assessment of all the intelligence gathered so far, but will not present a final conclusion. That's in keeping with intelligence community practice: agencies assign a confidence level to their findings because intelligence isn't conclusive. And though sources tell CNN that the CIA has assessed with high confidence that the prince directed Khashoggi's murder, which was conducted by members of bin Salman's inner circle, the fact that they don't make a final conclusion gives the White House an out. Indeed, Trump told reporters as he left for Thanksgiving in Florida that the CIA "didn't make a determination ... they have nothing definitive and the fact is maybe he did, maybe he didn't." The Trump administration is relying on Saudi Arabia to help it achieve its goals in the Middle East on an Israeli-Palestinian deal, fighting extremism, rebuilding Syria and countering Iran, which the President mentioned in the second line of his statement to bolster the claim in his first sentence that "The world is a very dangerous place!" Saudi Arabia can also help ensure that US sanctions against Iranian oil, which take an estimated 1 million barrels a day off the market, don't roil international energy markets. Khashoggi's killing has drawn attention to Trump's business ties to Saudi Arabia and the relationship between bin Salman and Trump's son-in-law and senior adviser, Jared Kushner, who has assiduously courted the crown prince and arranged Trump's first overseas trip to the kingdom. Daniel Drezner, an international politics professor at The Fletcher School at Tufts University, told CNN that it's hard to understand why Trump isn't leaning harder on Saudi Arabia, saying that the US can exert more leverage than it is choosing to. "The fact that they're so reticent to do it shows a real misunderstanding of the" balance of power, he said. Saudi Arabia needs the US for military support and protection, for help in countering Iran and fighting extremists, among other things. Trump "seems remarkably wimpish" with respect to Saudi Arabia, Drezner said, adding that Trump might feel a kinship to the Saudi royal family. "There's otherwise no real explanation for why he's not applying more pressure," Drezner said. Some lawmakers are proposing investigations into the Trump family's financial ties to the Kingdom. Trump, who has boasted of selling $40 million and $50 million apartments to Saudis and has seen Saudi money pour into his hotels since he was elected, claimed Tuesday that he has no financial interests with the Kingdom. "I have no business with Saudi Arabia, couldn't care less," Trump said. As outrage has grown on Capitol Hill and overseas, the President, Secretary of State Mike Pompeo and Bolton have stressed the need for patience and the importance of US ties with the Kingdom. Pompeo briefed reporters at the State Department, defending the decision not to take strong action against Saudi Arabia for the US resident's death by saying "there are important American interests to keep the American people safe." Pompeo met with Turkey Foreign Minister Mevlut Cavusoglu on Tuesday at the State Department, where the two discussed the journalist's killing at the Saudi consulate in Istanbul, including the possibility of launching an international investigation into the case. "We have to see the outcome these investigations, but he didn't say he's against international investigation, but he emphasized that he wants to see," Cavusoglu said in a briefing to Turkish press. Turkey has also suggested it wants to continue its business relationship with Saudi Arabia, even while pressuring it over the murder. "We see that West does not want to ruin their relations with Saudi Arabia because of this murder. We do not want to ruin our relations with Saudi Arabia either," Cavusoglu said. "But we will not give up our principles," the foreign minister said. "Laws come first for us. We believe in an international system based on law. This murder has to be revealed. Who gave the order, this or that? Does not matter. Who gave the order has to be revealed." According to the Committee to Protect Journalists, Turkey was the world's worst jailer of reporters in 2017, for the second consecutive year. Saudi Arabia announced last week that 11 men had been indicted for the "rogue operation" and that five would face the death penalty. In what appeared to be a coordinated move, the Treasury Department the same day announced sanctions against 17 Saudis over their alleged roles in the killing. Asked if Trump's statement indicated the US was putting business interests above human rights, Pompeo referred to the Treasury sanctions as "a very strong response." Sen. Paul said the sanctions amounted to the administration "pretending to do something," since some of the men already face the death penalty in Saudi Arabia if convicted. Trump, who derided the Saudi explanations as "the worst cover-up ever" in late October, made clear in his Tuesday statement that he views the killing in transactional terms. Citing promised Saudi investments in the US that could generate jobs and military contracts worth billions, even as he wildly inflated their worth, Trump said that "if we foolishly cancel these contracts, Russia and China would be the enormous beneficiaries and very happy to acquire all of this newfound business." He will likely run into headwinds from Capitol Hill, as lawmakers of both parties issued excoriating responses to his statement. "I plan to vote against any future arms sales and appropriation to Saudi Arabia," Sen. Dianne Feinstein, a California Democrat, said in a statement. She added that the US should consider sanctioning the crown prince, who is known by his initials MBS, and expel the Saudi ambassador to the US. Earlier Tuesday, Corker told CNN that Congress would respond with "additional pressure" on Saudi Arabia if the administration doesn't name the Saudi crown prince as part of its sanctions determination under the Magnitsky Act, legislation that allows for sanctions on human rights grounds. "We are looking at ways to respond and apply additional pressure if the crown prince is not named," Corker said. In a statement Tuesday, Graham condemned Trump's decision without naming the President. "I fully realize we have to deal with bad actors and imperfect situations on the international stage," he said. "However, when we lose our moral voice, we lose our strongest asset." On Sunday, Graham told NBC's Meet the Press that a team of Saudis close to the crown prince "don't get on two airplanes, go to Turkey and chop a guy up in a consulate who is a critic of the crown prince without the crown prince having known about it. And sanctioned it." Graham also said that Saudi Arabia "will have a hard time on the world stage" as a result of the murder. "When it comes to the crown prince, he is irrational, he's unhinged, and I think he has done a lot of damage to the relationship between the United States and Saudi Arabia." The prince has led Saudi Arabia into a series of foreign policy misadventures that have rippled through the region. He has aggressively pursued a war in Yemen against Iran-backed Houthi rebels that have led the UN to assess the Kingdom might be guilty of possible war crimes there, as millions starve due to a Saudi-led blockade. Bin Salman has created a diplomatic rift with Qatar, complicating US strategic interests in the region. He briefly detained the Lebanese prime minister inside Saudi Arabia and triggered a rift with Canada after an official sent one tweet about the detention of a Saudi human rights activist. The President's statement and the CIA report on Khashoggi's killing come seven weeks after the father of four, entered the Saudi consulate in Istanbul on October 2 to seek marriage documents. Trump had already been briefed by CIA Director Gina Haspel, who traveled to Turkey to meet with officials there about their findings and allegedly heard a recording the Turkish government had made of the killing. The Turks have said Khashoggi was set upon, beaten and dismembered soon after he entered the consulate. After changing their story for weeks, Saudi officials said that the team was sent to convince the journalist to return to Saudi Arabia. They say he was injected with a drug that was meant to temporarily subdue the journalist, but that he was accidentally given an overdose. It is still not clear where Khashoggi's body is. CORRECTION: This story has been updated to reflect that some of the men implicated in Khashoggi's murder face the death penalty in Saudi Arabia if convicted.